From the Dutch ‘de nieuwe beelding’, neo-plasticism basically means new art (painting and sculpture are plastic arts). It is also applied to the work of the De Stijl circle of artists, at least up to Mondrian’s secession from the group in 1923. As a pure representation of the human mind, art will express itself in an aesthetically purified, that is to say, abstract form. The new plastic idea cannot therefore, take the form of a natural or concrete representation – this new plastic idea will ignore the particulars of appearance, that is to say, natural form and colour. On the contrary it should find its expression in the abstraction of form and colour, that is to say, in the straight line and the clearly defined primary colour. Neo-plasticism was in fact an ideal art in which the basic elements of painting – colour, line form – were used only in their purest, most fundamental state: only primary colours and non-colours, only squares and rectangles, only straight and horizontal or vertical lines. 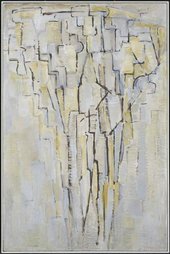 Mondrian had a profound influence on subsequent art and is now seen as one of the greatest of all modern artists.